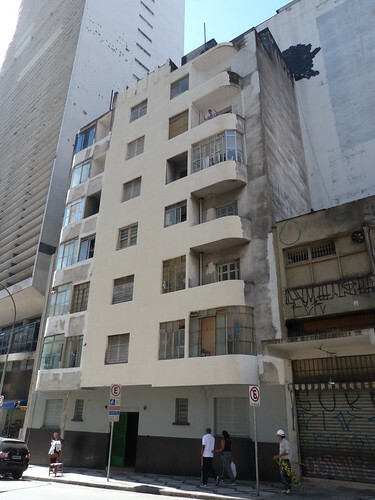 I like these apartments in São Paulo because, to me, they show the process of, if not gentrification, then certainly maintenance and restoration of older buildings. Both good and bad aspects. One of the obvious signs are the partial paint job yet there is no sign of paint or scaffolding or other materials to complete the job. Also some of the balconies have been enclosed which I personally think is a shame but then I don't live in an apartment block. A less obvious sign of the possibly gentrification is the footpath in front of the building. It appears to me that individual buildings in Brazilian cities are responsible for their part of the footpath so you can get variations such as we see here. My son lives in a 1930s Deco building in Tel Aviv in which most of the lovely open balconies have since been closed in. I of course asked why. He said most families only had 2 bedrooms in their flat, so if a parent or aunt came from overseas to visit, there was nowhere else to put them. Thanks Helen. It is so easy to stand on the outside and criticise people for altering their homes without understanding why they have done it.